Line Wobbler is a one-dimensional dungeon crawler game with a unique wobble controller made out of a door-stopper spring and a several meter long ultrabright LED strip display. The entire game runs on an arduino, including sound, particle effects and 60+fps. 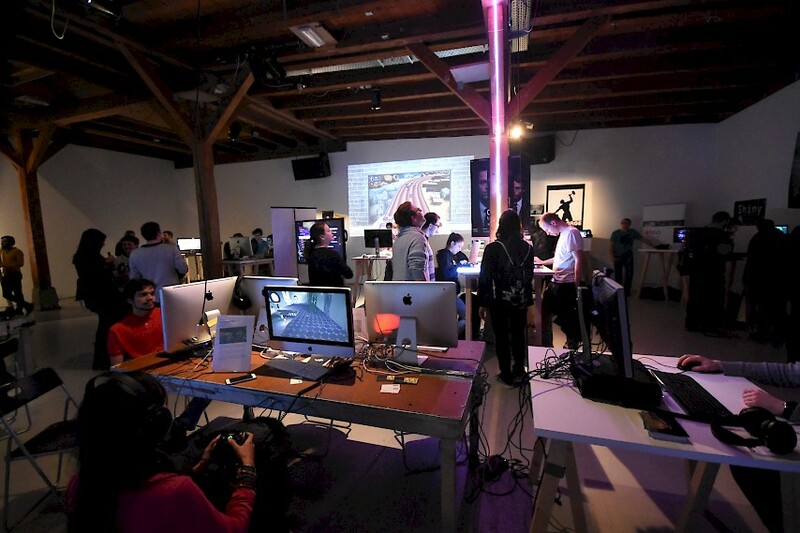 It's been exhibited in quite a few places now (such as the Experimental Gameplay Workshop at GDC 2015, Burning Man 2015, London, Chicago and Oslo) and won two prizes at the AMAZE Awards 2015 in Berlin. Line Wobbler has won the Game Design Award at IndieCade 2015 in Los Angeles, and the Best Game Design, Best Presentation, and the Audience Awards at Sense Of Wonder Night at the Tokyo Game Show 2016. A special festive two player 25 meter Christmas tree version has been built for Kings Cross Station in December 2017, there's a dedicated page for it here . Line Wobbler is part of the major V&A exhibition Videogames: Design/Play/Disrupt, running now until the 24th of February 2019 at the Victoria & Albert Museum in London! Using a spring, an accelerometer and a rigid surface, the Wobble controller is a tactile and surprisingly precise joystick with a unique 'wobble' action (pull it back and let go to make it oscillate back and forth rapidly). It is this wobble action that is core to the experience and the game we have created for it. Initially made out of a shoe-tree spring and door-stopper springs, I'm now using custom made springs that have been designed specifically for Line Wobbler. Fun fact: the original inspiration for the controller came from this cat video. We use a long strip of densely packed LEDs, which are both super™ bright and physically flexible. Using selective brightness for specific particle effects, we evoke the retro-feeling of vector-displays (remember the bullets in asteroids? Very satisfying!). The flexibility of the strip allows us to incorporate physical space into the game by bending and looping the display around objects and walls, and modifying in-game objects according to the strips' orientation, breaking out of the rigid linearity that a 1D display imposes. Note: The display is actually so bright that it's quite hard to film and take photos of it, appearing a bit washed-out on the media below. The game is a one-dimensional dungeon-crawler where the player navigates obstacles and fights enemies to reach the exit. Movement is controlled by bending the Wobble controller left and right, while enemies are attacked by wobbling. Obstacles such as lava fields, conveyor belts and slopes (which can be modelled according to how the strip is placed in real life) challenge the navigation skills of the player. The sound effects are basic modulations of sine-waves, whose frequency is directly controlled by the acceleration of the controller, enhancing the wobble effect. Exhibited at Game Science Center Berlin special exhibition on Alternative Controllers, 8th Dec 2014 - 8th Jan 2015. Exhibited at Spillkonvent 2015 in Oslo, Norway, June 2015. The Line Wobbler is being exhibited at the Game Science Center in Berlin, Germany. I also have a few prototypes in London, UK, that I show at events occasionally. Currently I'm hand-producing a small batch of copies, so please send me an email (robin.baumgarten at gmail) if you're interested in showing the Line Wobbler!